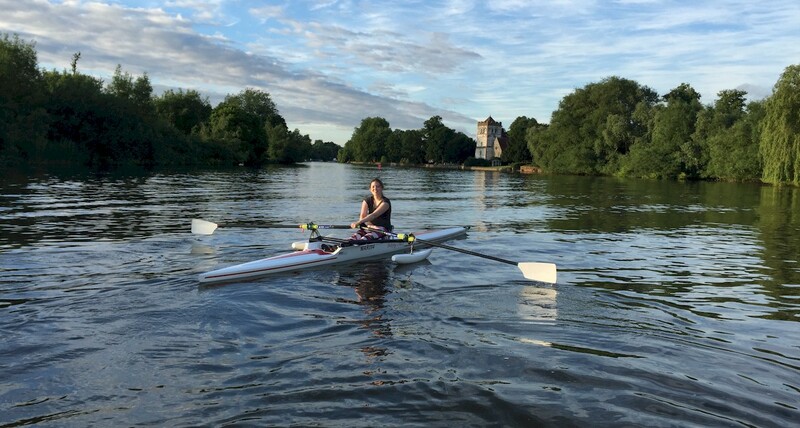 This post comes to you courtesy of British Rowing’s Paralympic Pathway Coach Ella Willott. As it happens, Ella was the one who first established the adaptive/pararowing programme at the Marlow RC including recruiting me as a volunteer to run it and coach. Like most folks at British Rowing, she wears about a dozen hats including outreach to help clubs developing their own pararowing programmes. When we met up recently, we got into a discussion about the dangers of boats capsizing with pontoons. One would think that a boat with safety pontoons really shouldn’t capsize. Yes, the incidence of capsize is massively reduced. But the severity (the other side of the risk equation) remains exceptionally high especially when you have an impaired individual strapped into the boat if and when it tips over. Ella and I both were present (though neither involved) with the capsize at the Pararowing Development Camp she mentions below. I have also experienced pontooned boats capsizing. One was by George Bull-McLean who at nearly 7-foot tall simply had the leverage and size to tip even a boat with safety pontoons. Does the boat have an adaptive rigger with a shortened span? A narrower span will bring the pontoon floats closer to the centre-line of the boat, and therefore offer less stability. What is the height of the floats? The height of the pontoons off the water will affect the stability offered by them- the higher the floats are set off the water, the less stability they offer. The lower the floats are set, the more contact they have with the water, and the more stability they offer. However, the latter could also cause the floats to submerge or dig into the water if there is weight bearing down on them. 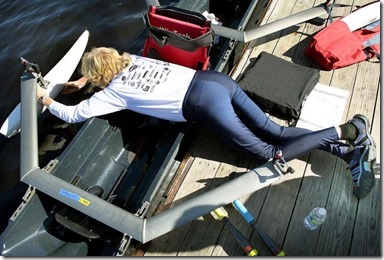 Does the impairment of the rower impact on their ability to sit centrally in the boat? If the rower has one side of the body more compromised in terms of function that the other, they may lean to one side in the boat. There are quick fix solutions to this such as padding, but this should be an important consideration prior to boating, as any weight leaning into one side could cause the pontoon float to submerge and de-stabilise the boat. It is EXTREMELY DIFFICULT to right an upturned adaptive boat fitted with pontoon floats. During testing we needed two individuals of considerable physical strength to attempt to turn the boat back the right way, and with someone sitting in the fixed seat it would not have been possible. We strongly advise against relying on this as a response to an adaptive rower capsize. The rower will need to free themselves from the boat, and if they are strapped in and cannot release the straps, they will need to be safely cut free from them using a safety knife, as time is of the essence while someone is submerged. Other Adaptive Equipment – The use of ‘Active Hands’ strapping on an oar handle can be helpful to those rowers with reduced grip. Through our own testing of Active hands it should be noted that in the event of a capsize individuals will need a free hand to remove the strapping, as when we strapped both hands and tried to release the straps by mouth, we were very unsuccessful. Therefore we suggest that the strapping of both hands to oar-handles poses a significant danger in the event of a capsize. Prosthetic Limbs – Rowers, coaches and helpers need to ensure that they know how the rower with prosthetic limb/s will release themselves from the boat during a capsize. This may involve a release mechanism on the prosthetic itself, which allows the rower to free their residual limb from the prosthetic that remains attached to the boat, or it may be that the rower exits the boat with the prosthetic still attached. In the former case, where the rower releases from the prosthetic, the rower will need to ensure that the mechanism for release (often a button on the side/front of the prosthetic that must be pushed for release) is functional prior to boating and is tested during a capsize drill. Regular risk assessments are important for the safety of all rowers, be they adaptive or able bodied, and the considerations apply across the board. Coaches, helpers and volunteers should assess risk on the basis of: the individual/s concerned, the environment, conditions, equipment, and so on. All adaptive rowers should be taken through a capsize drill within a reasonable and appropriate time frame of starting on-water rowing in order to manage the risks posed by the additional equipment and/or impairment of the individual rower.